Hope you’ve been enjoying your free Research Intelligencer trial. We’ve been enjoying publishing it. As you can probably tell by now, our main focus is on uncovering the best research, data and analysis explaining the values exchanged in advertising, media and marketing. Sometimes we do that by simply reporting on what other people tell us. Sometimes, we do it by working directly with the best sources of industry intelligence -- people like PQ Media’s Patrick Quinn and Leo Kivijarv or Publicis Groupe’s Rishad Tobaccowala. And sometimes, as you’ll see elsewhere in today’s edition, we do it by partnering with others to create new, original research to answer previously unanswered questions. One of those partners is Pollfish, an innovative platform enabling users to scale quick, high-quality surveys by engaging nearly half a billion app users worldwide. Thanks to Pollfish, we’ll deploy at least one original survey each week, and more when the news cycle merits it. As someone who has covered the industry’s research intelligencers for more nearly four decades, I know as well as any journalist about the pitfalls of reporting on research, and the methodological debates that ensue. Toward that end, I’d like to point you back to the boilerplate on the bottom of every edition we publish, and remind you that we are journalists reporting on research and data that we believe tells important stories that provide valuable intel to our readers. If you want to debate methodology, criticize research quality, or grouse on our analysis, interpretation and reporting, have at it. We welcome your comments on every story, and for any of you who want to step up to the plate and write your own analysis, commentary, or even publish your original research, we welcome that too. In fact, we’re counting on the fact that many of you will, mainly because you know you’ll reach other intelligencers. As we reported in Friday’s and today’s editions, the ad industry -- indirectly or directly -- pays considerable sums to reach, engage and influence consumers. Depending on how you calculate it, it’s somewhere between $1 per hour of ad-supported content to about $3 per hour of pure advertising time. Keeping that value in mind, we think the price we’re asking to keep you informed about things like that is a fair price to pay. Actually, it's an incredible deal. When we first published our annual subscription rate of $495, some readers groused it was too high. Well, as Palmer rightfully noted, somebody has to pay for media. For the 20+ years MediaPost has published, that somebody has been the “supply-side,” technology vendors, media suppliers and other services providers who purchased display advertising or other forms of sponsorship in order to provide our content free to the rest of our readers -- mostly the "demand-side." Well, we're going to extend that model to a subscription revenue model, because Research Intelligencer has no advertising -- just pure, unadulterated intel. Here's how it works: If you qualify as a bona fide “demand-sider” -- someone at an advertiser or agency who controls media budgets -- you will be able to subscribe by exchanging a little information about yourself. All others will need to pay cash. If $495 seems like a lot for you to pay, consider two things. One -- many of your partners on the demand-side, including some of your most valuable customers or prospects, will be getting the intel we publish daily, thanks directly or indirectly to people like you who are paying for their subscriptions. Aside from being their benefactor, do you really want to be out of the loop on what your customers know? For the second point, let me break the value exchange down in terms similar to what we've been reporting on the past couple of editions: the value of people’s time. 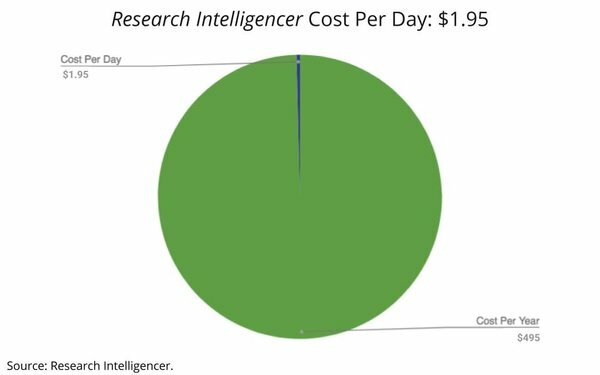 If the marketplace intel we publish seems pricey at $495 per year, what about $1.95 daily? Or do you need me to compute the hourly rate? 6 comments about "Speaking Of Value Exchange ...". Carol Lewis from Riverton Media LLC, April 2, 2018 at 11:17 a.m.
What a concept! NON-sponsored content. Love it. David Cooperstein from Figurr replied, April 3, 2018 at 9:48 a.m.
Joe Mandese from MediaPost replied, April 3, 2018 at 10:45 a.m.
@David Cooperstein: I don't follow your logic. What's the methodological issue? The pie chart is a visualization of data. The data is the cost of an annual subscription ($495) and the cost of paying for one day ($1.95). You can subscribe either way. James Smith from J. R. Smith Group, April 3, 2018 at 8:50 p.m.
Joe: Some initial reacitons. One item that concerns me about most research reports published on marketing/media sites...non-projectable sample sizes. It's hard, for example, to consider a study of 127 B2B and B2C marketers as anything beyond probable wind direction, 10 days out. And, sampling error figures should also be reported as a matter of standard practice. Sampling practices are woefully under reported. Convenience samples are NOT preferred...but it seems that they are widespread and given coverage. One litmus test: Is the data actionable or just a nice to know. If nice to know or too general, then value drops. A distinct positive is access to the data or extensive crosstabs...although that might prove problematic. Crosstab that study of 127 by B2B/B2C respondents and you get an n of less than 65 per cell! Not going to the bank with that. I also prefer stories/analyses that include back links to more detailed report/data. Joe Mandese from MediaPost replied, April 4, 2018 at 8:22 a.m.
@James Smith: If that's hard for you, my recommendation is that you should not consider coverage of anything with sample sizes that don't meet your criteria. We disclose as much as we can about everything we report on, or point readers directly to boilerplate. In case it hasn't been clear so far, Research Intelligencer is not a "research organization," it is a publication produced by journalists who organize information from a wide variety of sources, utilizing a spectrum of methods and samples, to produce market intelligence. Our mission is to unearth what we consider to be the most important and potentially market-moving intelligence by reporting on data, analytics, insights and research we can gain access to. As a journalist who has covered research for more than four decades, I often cover issues involving methodlogies, sample sizes, etc., and that will continue to be part of RI's mission, when appropriate, and especially when they have the potential to impact advertising, marketing and media markets involving our readers. But I also know there is all kinds of market-moving data and research in the world. Sometimes it's Research with an upper-case R, and sometimes it's research with a lower-case one. We will always disclose the criteria and the source and it should be up to our readers to determine the validity, applicability and actionabilty of what we report on. Our job is to report on what we believe to be meaningful. Sometimes, the most meaningful intelligence is data based on a sample of one, sometimes it's enumerated to the U.S. Census. We are utilizing journalistic criteria to determine what we cover and how we report on it. Lastly, we disclose as much in every edition of the Research Intelligencer newsletter. It's the boilerplate at the bottom, which was crafted by long-time media and marketing research authority Gabe Samuels for us more than a decade ago. We revived it for this newsletter, because I think it still captures teh spirit of our intentions and is still the appropriate disclosure. Joe Mandese from MediaPost, April 4, 2018 at 8:23 a.m.
We use the term research in the broadest possible sense. We do not perform an audit, nor do we analyze the data for accuracy or reliability. Our intention is to inform you of the existence of research materials and so we present reports as they are presented to us. The only requirements we impose are that they are potentially useful and relevant to our readers and that they pass the rudimentary test of relying on acceptable industry standards. We explicitly do not take responsibility for the findings. Please be aware of this and check the source for yourself if you intend to rely on any of the data we present.